German Holiday Christmas Pyramid. 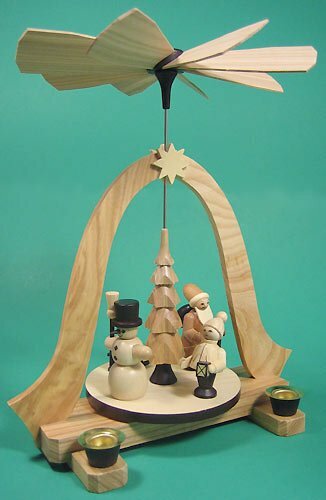 With children showing the way and carrying the lantern and Santa with his bag of treats this beautiful German Holiday Christmas Pyramid in Natural Wood shows beauty with the contrasts of the natural wood and dark stain paint around the spinning edge. Note the beautiful curves. Stands about 11 inches tall and needs 4 medium. candles to turn. German Pyramids are handcrafted with scenes to delight your family at Christmas.